Each year, drownings affect a wide swath of outdoor enthusiasts. From people swimming in lakes and rivers, standing on docks and wading in rivers to warm-weather anglers, ice anglers and boaters. As hotter summers push more people toward water, drownings can increase. Luckily, many of these deaths are preventable. Failure to wear a Coast Guard approved life jacket. Some of these tips are common sense, while others require skills or action to avoid tragedy. Pay attention to the included statistics, Make these top tips routine and you and your loved ones can stay safe while enjoying all the great sports and recreation that water provides. Roughly one-third of Americans lack adequate swimming skills. Swimming is a life-saving, life-long skill worth knowing. Bolster your abilities or learn to swim by taking formal swimming lessons. Inquire at municipal pools, colleges and YMCA facilities. Based on U.S. Coast Guard statistics, nearly 75 percent of boating deaths result from drowning. In nearly 90 percent of those deaths, life jackets were not worn. Wear properly sized, U.S. Coast Guard-approved life jackets regardless of the distance traveled, boat size or swimming ability. In 2007, 29 percent of boating deaths nationwide occurred on boats that were anchored, docked, moored or drifting. Among adolescents and adults, alcohol is involved in up to 70 percent of water recreation deaths, nearly a quarter of emergency room visits for near-drowning and about one-in-five boating deaths. Alcohol alters balance, coordination and judgment. Its effects are amplified by sun exposure and heat. Stay sober near any body of water. CPR from a bystander is proven to save lives and improve outcomes for near-drownings. The quicker CPR begins, the better the results. In the time needed for paramedics to arrive, your CPR skills could save a life or prevent permanent damage. If already certified, learn the latest techniques and refresh your skills by becoming re-certified each time your card gets close to expiring. Inquire at your local hospital, workplace or doctor’s office for classes. A responsible adult needs to constantly watch young children when swimming or playing near water as drowning occurs quickly and quietly. Be close enough to touch the child at all times. A submerged person is often difficult to find due to the low-visibility of some bodies of water. Rivers and lakes may have hidden hazards such as sudden drop-offs, holes, submerged shelves, and trees or tree roots, foot holds and rock ledges. Exercise caution near all waters. Remember rivers, streams lakes and ponds unlike swimming pools are always at natures mercy and can change on a daily basis. Pay close attention to current strength. What looks like a quiet slow moving stream may have a strong current or under-tow. Currents can often be deceiving even for strong swimmers. Currents also change depending on many factors of nature. On rivers, stay clear of sweepers and strainers—fallen trees and logs that lay across portions of waterways where currents can hold watercraft and occupants underwater. Avoid drop-offs near sand and gravel bars. On large rivers, sudden drop-offs can measure more than 5 feet, posing hazards for children and weaker swimmers. Re-circulating, powerful currents from even small low-head dams are unforgiving drowning machines. Stay clear above and below all dam areas. First try to reach victim with whatever is available. Stay onshore and extend a branch, pole or rope to pull victim ashore. Second, try to throw a line, buoy or floating object. Or remove your shirt, kneel down while holding one sleeve and throw out the other sleeve. Remove pants to tie one leg to sleeve to increase reach. Row, or use a watercraft, when the victim is farther out. In a canoe, kneel and paddle alongside so the victim can grasp the side to tow to shore. Go as a last resort only if the first three steps can’t be used. Keep eyes on victim and remove shoes and excess clothes. Jump, do not dive, into water. Carry a shirt, pants or towel clenched in your teeth. Swim near enough to extend clothing and tow victim. If you have nothing to extend, approach victim from behind and tow to safety by the hair. 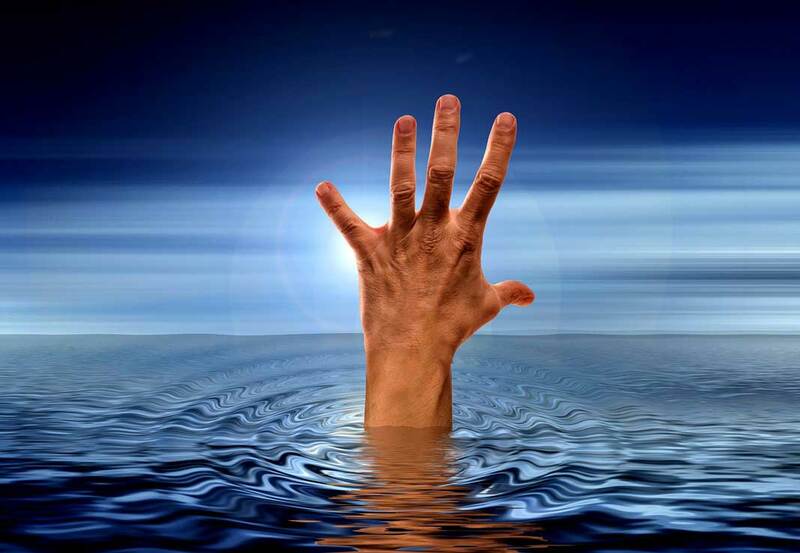 Don’t allow victim to latch onto you and never attempt a rescue beyond your swimming ability.